"Go With the Home Boys," "It's Best to Go With Those You Know in Tennessee's Only Mounted Regiment," "Join Chattanooga's Own Volunteer Battery." These were slogans used to entice volunteers to sign up with Battery B of the 114th Field Artillery Regiment. Organized by U.S. Sen. Luke Lea, the regiment included recruits from all parts of the state as was the custom with previous Tennessee volunteer units. Chattanooga was assigned Battery B. Its enlistment headquarters was in the old Armory at Market and Fourth streets. The recruits had spirit but for months lacked any regular army trappings. Khaki pants, olive shirts and campaign hats formed the semblance of a uniform. When the University of Chattanooga closed for the summer, the Battery moved its headquarters to the school's gymnasium and used Chamberlain Field for drill instruction. The soldiers made do with army cots and marched to restaurants on Oak Street for meals three times a day. 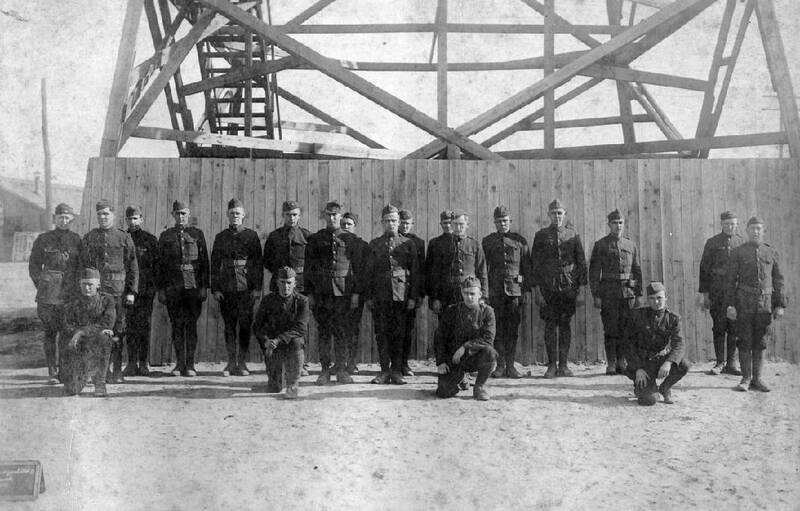 In September 1917, Battery B traveled to Camp Sevier in South Carolina. Two shacks in the heavily forested region, one with a latrine, the other with a kitchen, greeted soldiers. They spent three months clearing the forest and building streets, officers' quarters, showers, kitchens, latrines and floors for tents. Rough conditions, poor food and bad weather gave the nickname "Camp Severe." January's weather was especially brutal. Corp. Ernest P. West, author of "Chattanooga Battery B," described taking a shower with no hot water: "The bathing program for about two weeks was as follows: strip naked in your tent by the little Sibley stove, get a bar of soap and a towel, run bare-foot the hundred yards or so in the snow and ice to the bath house, balance yourself on the sheet of ice, turn on the cold water, pass a little soap over the body, rinse it off, rub dry as possible and dash back to the tent and dress. A daily shave was ordered from headquarters, which was a pleasure with ice water." The soldiers eventually built more kitchens, latrines, and quarters, received pay and uniforms and trained with artillery and horses. In May 1918, Battery B boarded a British transport for England. The ship had previously carried cattle. The smell, combined with close quarters, poor food and rough seas, made for a turbulent journey. The troops arrived at Guer, France, in June and drew their full amount of guns and equipment. Their field pieces were French Seventy-Fives. The soldiers had to learn French to handle the horses, which came from farms in Brittany. The batteries of the 114th Field Artillery came from different parts of Tennessee. Batteries E and C were composed of Nashville "blue-bloods" and educated sons of politicians. West related, "both A and B were strongly salted with farmers, bootleggers, and ex-convicts, prize fighters, touts and some scum." Battery B won all contests in range competition. Battery B's first significant encounter came in the battle of St. Mihiel. Soldiers spent three days in the attack, eating only a can of bully-beef and hardtack. The Americans "astonished" the French and British with the success of their labors. Battery B next fought in the Meuse-Argonne Offensive near the town of Avocourt. The sight of a pig on the no-man's land caused both sides to forget the war and watch the spectacle. Two men finally brought the pig down and dragged him back to the American side. On the Woevre Plain in November, Battery B learned the war was over. The brigade stayed on as part of the occupation army until sailing for home on March 10, 1919. On April 3, Battery B led a "parade to end all parades" down Chattanooga's Market Street. Two items at the Public Library tell much about Battery B: Ernest P. West's history and a photo album of Gus A. Wood, a sergeant in the unit, donated by his son, Gus A. Wood III, in 1989. The album holds 130 photographs of the Battery at Camp Sevier, in France, and at some of the reunions. Gus Wood and Ernest West had grown up together. West described Wood: "After returning to the States he stated that he had fought everybody in the battery and never won a fight. He fought a number of times but he won most of his battles." Suzette Raney is an archivist at Chattanooga Public Library's Local History Department. For more information on Battery B and the 114th Field Artillery Regiment, visit the Public Library at 1001 Broad St. or call 423-643-7725. For more information, visit Chattahistoricalassoc.org.